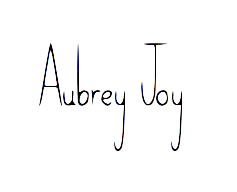 Oh, and just a reminder: I am doing a giveaway when I hit 200 followers! Stay tuned for that! A phenomenal worldwide bestseller for over thirty years, Richard Adams’s Watership Down is a timeless classic and one of the most beloved novels of all time. Set in England’s Downs, a once idyllic rural landscape, this stirring tale of adventure, courage and survival follows a band of very special creatures on their flight from the intrusion of man and the certain destruction of their home. Led by a stouthearted pair of friends, they journey forth from their native Sandleford Warren through the harrowing trials posed by predators and adversaries, to a mysterious promised land and a more perfect society. Hazel and Fiver are rabbit brothers living in a warren with many other rabbits. Fiver has visions and he tells everyone they need to leave their home because it will be destroyed soon. Not too many rabbits believe Fiver and they stay. Fiver and Hazel and a few others flee from their home just in time. The small group that left finds out that all the remaining rabbits they left were killed by humans. They know they can’t do anything about it, so they keep moving, They come across a warren with other rabbits that are very strange. Hazel’s group knows something’s up, but don’t figure it out until it’s too late. They escape and start making their own burrows, but they realize that they don’t have any does. How can you start a warren with no females to produce offspring? The answer: you can’t. How does Hazel find does? What length does he go actually go o to get the females? The world may never know. Ha, just kidding. Just read this book. Once you get past the whole, why are there talking rabbits, thing the book is beautiful. This has easily become a favorite of mine. I really enjoyed the El-arairah stories too. I read this for my novel class and was very excited to read this because it’s my dance teacher’s favorite book. All in all I was very pleased with this book. I only had talked about Hazel and Fiver in my plot section because I didn’t want to give too much away, but my favorite character was Kehaar. Kehaar is a seagull/random bird who becomes besties with the rabbits. Yes, I get that it’s weird. I understand. I love this book, but there are so many characters. So. Many. The characters also had multiple names just to make it more confusing, and there were a jigazigabillion rabbits. Yes I just made up a word. Cool, go me. Definitely Kehaar. He’s a seagull with a German (? something like that) accent. I hate birds and am deathly afraid of them in real life, but reading about them isn’t too bad. Kehaar was just so funny. One of my favorite characters. Happy Sunday! This week went extremely fast for me and I had almost no homework which was amazing. Something awesome happened to me this week, well last night. I ordered an Erin Condren planner for 2015! Yes I am getting worked up and super pumped about a planner. I literally carry my planner everywhere with me. I write homework assignments in it during school, my dance classes, schedules in general, and when I need to post on my blog. I have had Walmart planners for about 3 years and they’ve worked alright, but I decided I could splurge on something like this because I would use it all the time. One amazing thing about the Erin Condren 2015 planners is that the cover is interchangeable so you don’t have to just choose one, you can get many. I also am in love with the layout of the planner. There is a full two page spread of the full month with places to write monthly goals on the side, but the best part is the weekly page view. Each day of the week is separated into morning, day, and night. I don’t usually do much in the mornings and don’t have appointments or work or anything because I’m at school, so I will probably use the morning section as a blogging and reading goals section. In the day section I will write all my school assignments, and in the night section all the things I have to do after school. I am seriously so excited! This was one of the pictures I saw that inspired me to get one of these planners. I think this is so cute and obviously so easy to customize. I am not the artsiest person on the planet, but I do know how to put color schemes together. I’m thinking I’ll color coordinate the theme of each week to the month’s color. 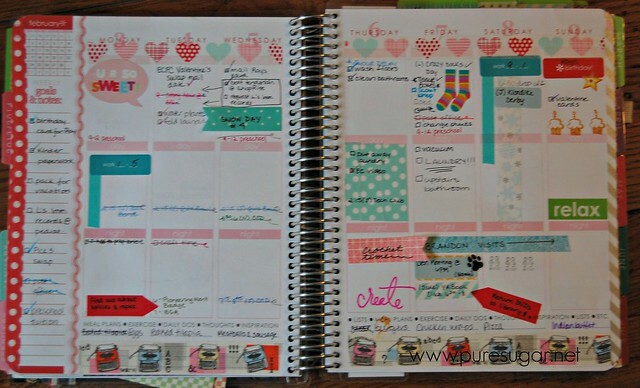 Almost all of the decorating done to these pages are created with washi tape. I am also obsessing over the song Trumpets by Jason Derulo. Have been listening to it on repeat for hours on end. As for my reading this week, it was a little slow. 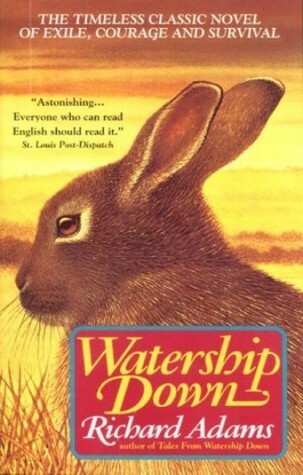 I will finish A Discovery of Witches tonight, I read about 60 pages of King Dork for my book club, and I’m almost done with Watership Down for my novel class. Sorry for the long post today! Thanks for staying with me even though I haven’t posted all that much!